Wrap your very own Little Princess up for a snuggle in this adorable baby blanket. Wrap your very own Little Princess up for a snuggle in this adorable baby blanket. 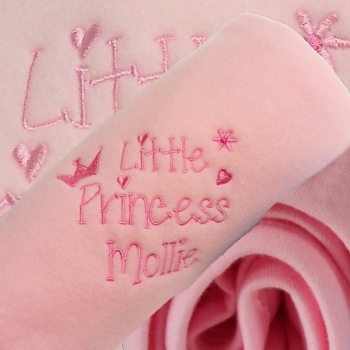 Baby pink fleece embroidered with a cute crown motif and the title Little Princess. Personalised with a single name or initials. Handy fleece blanket measuring 75 x 100cm perfect size for prams, car seats, baby changing bags and travel cots.